I purchased a Chromebook Pixel two weeks ago. My goal is to replace my lightweight travel laptop and hulky System 76 with dedicated GPU. Thought I would share my experience. It’s the only Linux computer I’ve used that successfully suspends and auto updates itself reliably. I stay in ChromeOS for most leisure use and light sys admin. ChromeOS comes with a simple terminal and you can install ssh apps for more (but still limited) features. I find myself using touch more than I thought I would. Usually I stick with the keyboard – I hate using a mouse. For terminal use I suggest using the Crosh Window app. You can ssh a foreign server or enter an Ubuntu chroot (more about that later). Here you can see me using Vim and a Django development server. Everything is running locally, no Internet required. Note this all requires Developer mode enabled. But ChromeOS isn’t fully open source! Oh noes! Neither is Ubuntu thanks to binary blobs. As for the locked down nature of Chromebooks – I see nothing wrong with a walled garden as long as you have a key out. That key is developer mode which is very simple to enable. One complaint – You have to press ctrl-D to boot every time after enabling developer mode. Annoying! The Pixel (unlike older chromebook models) can also boot directly into Linux like a normal computer. Other models require more creativity. ChromeOS is cute – but sometimes I need a real work environment. I went with crouton and KDE. Crouton has some oddities such as not working with upstart. That means services like mysql won’t start on “boot” but can be started manually. There’s a few other quirks but overall I’m pleased. It’s certainly easy to install and you can just keep using the ChromeOS Linux Kernel. I don’t like worrying about kernel updates so now I don’t have to. What is crouton? It’s a script to set up an Ubuntu chroot for ChromeOS. One can think of it as virtualization in that it lets you use multiple Linux environments at the same time. Unlike virtualization it uses only the original (ChromeOS) Linux kernel and therefore has very low overhead. I’m using KDE, a first for me, because it supports DPI changes better than other environments. The Pixel has such a high resolution, UI elements need to scale up to be usable. I found XFCE to be pretty bad at this. Changing the title bars in XFCE requires changing the images files. Yuck! 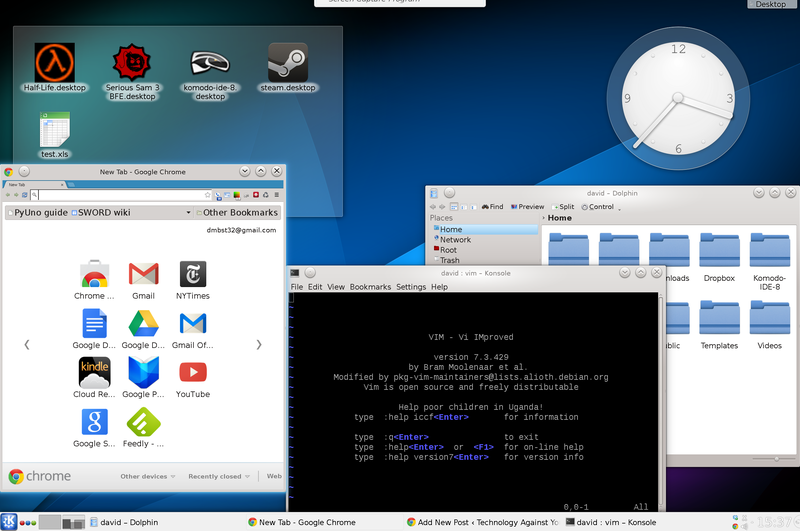 KDE looks very nice after just a few tweaks. Here is what I did. Touch with Crouton and KDE works surprising well. It’s not as good as ChromeOS, but you can scroll and use multi touch features such as changing work spaces. Even with KDE many UI elements are off. It’s livable and worth the wonderful resolution. I like editing code with such nicely rendered fonts. If you are going to spend 8 hours a day staring at text in a terminal – why not have really great text? You can see what scales and doesn’t scale on this screenshot. Occasionally I enjoy video games especially now that Steam for Linux is out. It does work but has some issues. The Intel HD 4000 GPU is minimally capable of playing newer high end games. I don’t really care much about graphics so this suits me fine. I was able to get Serious Sam 3 running with very lower resolution. I had to enable the X SWAT PPA and run the beta version of Serious Sam 3. Storage space is a big problem with gaming. I store my steam library on a USB disk. This is fine, but USB 3.0 would have been nice for a $1300 computer! Come on Google! So it loads slowly, but it does work. The Pixel can be taken apart fairly easily. However the memory is soldered on. It seems likely the battery could be replaced, but not nearly as easily as a traditional laptop. I don’t see the ram requirements of vim exploding any time soon so this is ok. The Pixel has some issues for sure. The selling point for me is the wonderful display and it’s the only high end, metal body, lightweight Linux computer out there. The only computer that comes close would be from Apple. Since I hate OSX and Apple’s entire business model, I’m sure not going to buy from them. I haven’t used another computer in two weeks so I’m pretty happy. Would I recommend it? For most people – no. Despite this good review I can’t think of many people who need a Pixel. If you are new to Linux, the Pixel is a little too hard to get traditional Linux running well on. You would be better off with System 76. Oh well, I love it! Thanks for this review, I found it to be the most honest and interesting out of all the others I’ve read, including the ‘professional’ websites. It’s been almost a year. If you’ve continued to use the Pixel, could you provide an update? I’m thinking of buying a nice, KDE- and Linux-compatible laptop for development, and this one seems to still be quite competitive. I’m especially interested in hearing your thoughts on battery life and on the hardware and software limitations inherent in the Pixel. Mark I’m still happy with the Pixel but it does have some limitations. I still get 5 hours of battery life so no complaints there. The laptop hinge because loose once but I tightened up the screw to fix it. I have no idea if this is common, I never heard of it happening to anyone else. Linux high dpi support is still lacking. The Pixel’s SSD is small and very slow for an SSD. The Dell XPS developer edition laptop is probably better but more expensive especially if you buy an ebay pixel. 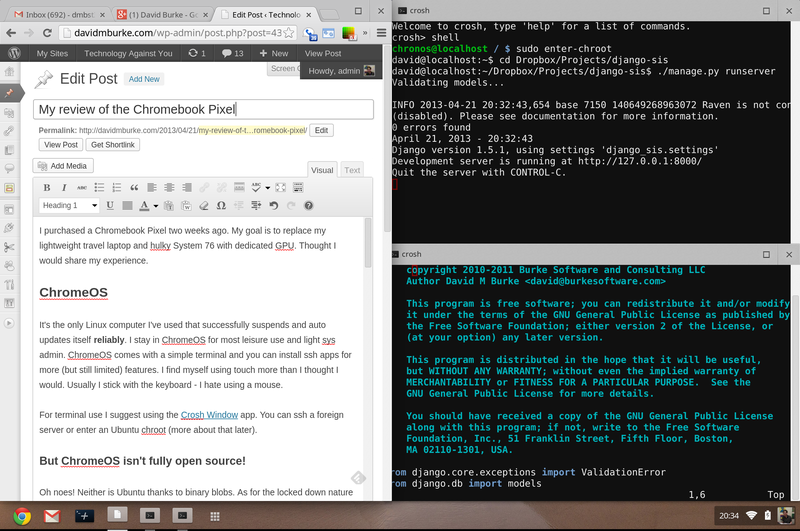 Running desktop Linux on the Pixel works and I like it but it’s a bit of a battle. If you want something that just works get the Dell or maybe a system76. If you like tinkering and the idea of a somewhat exotic laptop, get a ebay Pixel.